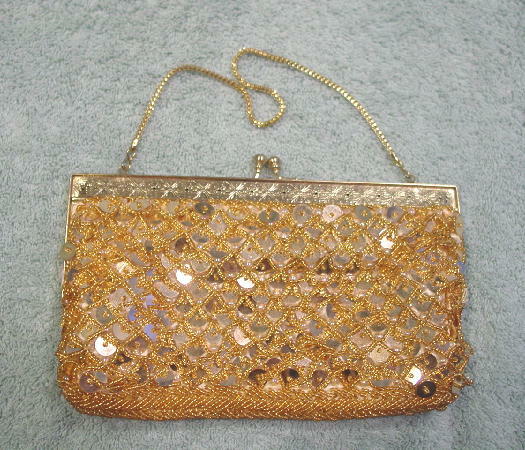 This vintage sequined and beaded purse was made in Hong Kong. It has an etched design on the gold-tone rim sides and there is a gold-tone bypass closure. 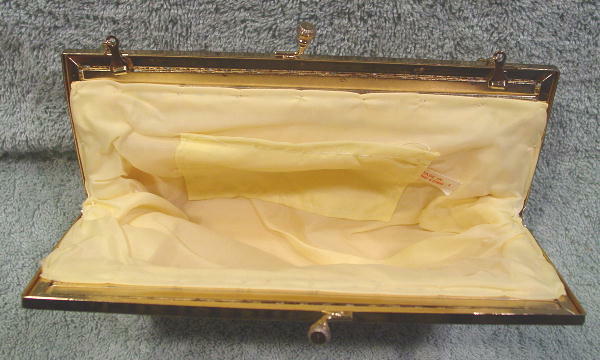 There is a light yellow fabric lining with a small open pocket. The exterior has a white fabric (probably acetate) background with a padding between it and the yellow lining. 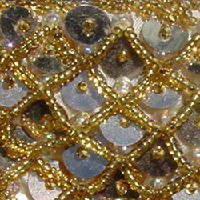 The exterior bottom has a design pattern of diagonal tiny gold-tone beads, and above that are large gold-tone sequins with a little bead in the center of each. Surrounding each sequin in freeform diamond shape patterns are little gold-tone beads. There are also large round iridescent beads. It has a 12" long fancy link chain which can be tucked inside so you can carry the purse as a clutch if you want. It's from a former French model/actress.